Plans are already in the works for an amazing week of training and networking for 2019! Mark your calendars now for May 5 – 9, 2019 in Asheville, North Carolina. If there are any topics that your Crime Stoppers program would like to see discussed, please let us know so that we can assemble a powerful line up of presenters that will leave all attendees with new information to bring back to their programs! If you’ve ever thought about joining the Southeastern Crime Stoppers Association, now is the time! We are in the process of planning our 2019 training conference, to be held in Asheville, North Carolina. We will offer training on various topics of concern, which will afford all attendees an opportunity to learn something new to bring back to their home program. While the Southeastern Crime Stoppers Association will be a source to learn, it will also be a time to join the Southeastern “family” – which we truly are. One of the greatest perks of membership is the networking not just at the conference, but with members all year long. If you’ve got any ideas or suggestions of things you’d like to do or learn about at the 2019 conference, please feel free to contact any member of the Executive Board anytime! 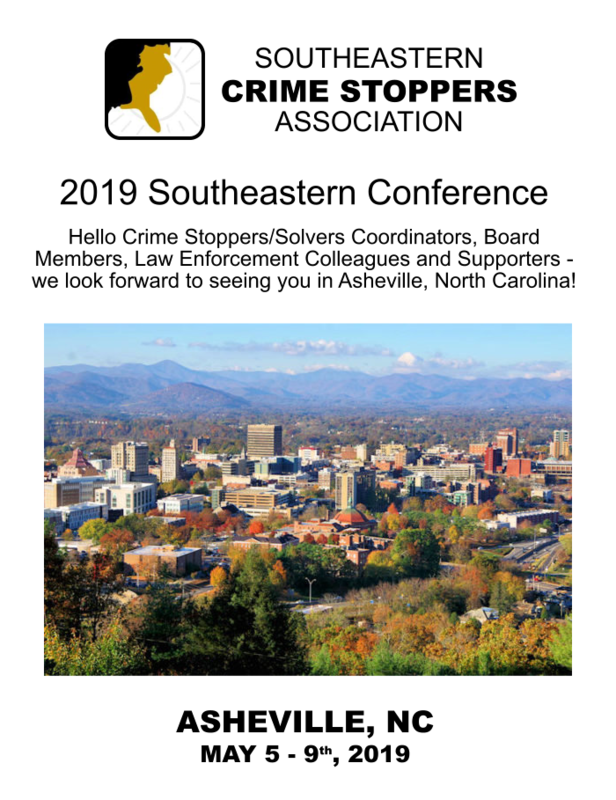 We look forward to hearing from our Crime Stoppers/Solvers members and hope to see everyone in North Carolina in May, 2019.